Work is set to begin on the £6.7m permanent home for the Great Tapestry of Scotland. 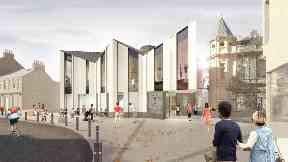 Scottish Borders Council has released new images of how the visitor attraction in Galashiels will look. Stirling-based Ogilvie Construction has been appointed to build the "landmark facility" and is expected to get to work within the coming weeks. 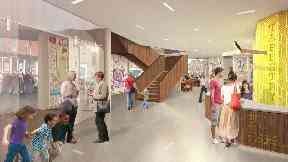 The visitor centre - which will feature exhibitions, events, educational facilities and a cafe - is expected to create 16 new jobs, attract up to 50,000 people to the town each year, and generate around £900,000 annually for the region's economy. Councillor Mark Rowley, executive member for business and economic development, said: "This is a hugely exciting time for Galashiels and the Scottish Borders." "I am delighted we now have an experienced and trusted contractor in place to take forward the building of this nationally significant attraction, with the artist impressions indicating it will be a stunning piece of architecture in Galashiels town centre. "Jobs will be created during construction of the facility alongside a wide range of social, economic and educational benefits once the building opens to the public. 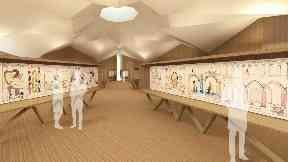 "Heritage and culture experts predict the centre will attract over 50,000 people to Galashiels each year once opened, as well as create 16 new jobs at the facility. "In addition, almost £900,000 of extra spending per year is predicted for the local economy, providing 12,000 extra visits to complementary attractions, supporting a further 17 jobs." The Great Tapestry of Scotland is a series of embroidered cloths made up of 160 hand-stitched panels which tell the story of Scotland from 8500 BC until its launch in 2013. It was created by 1000 people from across the country. Alistair Moffat, of the Tapestry Trustees, said: "The Great Tapestry of Scotland is an object not only of great beauty and power, it will also act as an engine for renewal. "As large-scale retail moves to the periphery of towns and cities, it is magnetic cultural attractions like the tapestry that will bring back life to the centres of these beautiful places. 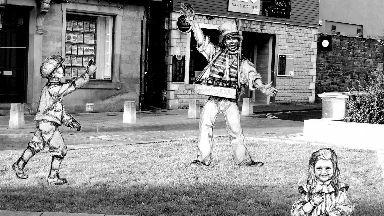 The work is part of a wider regeneration project, including a town trail and sculpture of Robert Coltart, the author of Ally Bally Bee. Councillor Rowley added: "The tapestry is the first stage of a wider masterplan to regenerate Galashiels, which is starting to see encouraging developments such as the expansion of local estate agents Cullen Kilshaw into the Transport Interchange and positive community feedback on the Coulter's Candy sculpture. "With the Jim Clark Museum set to open this year, a £1.3m Hawick Conservation Area Regeneration Scheme being announced this month and continued investment in key Scottish Borders events, there are more and more reasons for people to come to the Scottish Borders."